Meet the incredibly feature-packed RP50. Our engineers built the RP50 with the great tone and effects you expect from DigiTech®, including award-winning amp, cabinet and pick-up modeling and an arsenal of studio-quality effects. They didn't skimp on the processing either. The RP50 uses our AudioDNA™ DSP chip to ensure that both modeling and effects are world-class. Plus 24-bit A/D/A conversion so that no frequency response is lost between inputs and outputs. And when we weren't looking, our engineers even snuck in a drum machine with 30 patterns and an easy-to-use 13-LED array tuner. Then we made sure that the RP50's user interface was so simple a drummer could operate it (well most drummers, anyway). 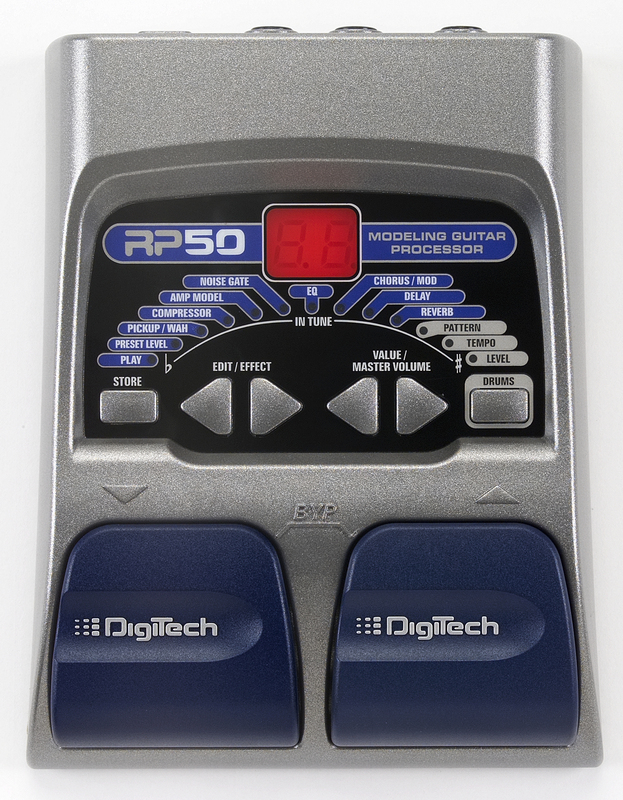 If you've drooled over our bigger RP Series models but didn't have that much cash in your jeans, get on down to your DigiTech dealer and score an RP50. How do I change the tempo on the drum patterns? Press the DRUMS button. Then press the EDIT/EFFECT buttons until the small red LED light is on TEMPO at the right side of the RP50. Now use the VALUE buttons to increase or decrease the tempo. How do I adjust the Tempo of the drum machine? Can the tuning reference be changed for a 1/2 step below? What is the reset for the RP50? Power up while holding the Left Edit /Effect button. When two horizontal lines appear in the display, let go of the arrow button. Then press and release the STORE button. How do I change the tempo of the drums? VALUE/MASTER VOLUME buttons to change the pattern.